This deal is subject to credit checks. Arrangement & excess mileage fees may apply. Find out everything you need to know on the new Fiat Fullback from independent vehicle review website Car And Driving. You can watch the video review to the left to see more of the car or read their written review below to get a true insight from an expert in the automotive industry. 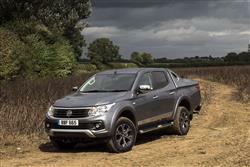 Fiat wants a slice of the growing UK pick-up market, so has borrowed Mitsubishi technology to create this Fullback model. Jonathan Crouch checks it out. In this Fullback model, Fiat has its first class-competitive pick-up. You've seen the engineering before, but the value proposition makes a lot of sense. Plus it's great off road and, if you tow, this vehicle is up with the very best in the amount it'll be able to lug about. The British pick-up market is growing. In 2015, over 40,000 models were registered, a jump of 20% over the previous year. Increasingly, it's not a segment that mainstream brands can afford to ignore, hence the entry of Fiat, Renault and Mercedes to this sector. All are taking the short-cut route to quick respectability in this class: namely in borrowing someone else's technology. In the case of the Fiat Fullback we're looking at here, that technology comes from Mitsubishi. If you are going to use any vehicle in this class as a template for your pick-up, then choosing the segment sales leader, Mitsubishi's L200 Series 5, seems wise. The styling's slightly different - slightly bolder many will think - but under the skin, this Fiat shares just about everything with its Japanese cousin. Which, as we'll see, is no bad thing. Under the bonnet, the 2.4-litre Mitsubishi engine gives this Fiat decent pulling power. With 178bhp and 430Nm of torque on-tap, the 0-62mph time takes a very un-pick-up-like 10.4s. As you'd expect, the Fullback can be driven in either 2WD or 4WD on tarmac or off road. The entry-level 150hp Fullback SX features an on-demand four-wheel drive system with three electrically-selected settings: 2H, 4H and 4L, while the LX and Cross models have four electrically-controlled settings: 2H, 4H plus 4HLc and 4LLC with a locking central differential. The vehicle can also tow up to 4.1 tonnes. And there's a segment-leadingly tight turning circle too. Thanks to the stiff chassis, handling is better than you might expect it would be from this class of vehicle and body roll, usually something of a problem in vehicles with higher centres of gravity, is usually kept in check, unless you're really pushing on. The suspension set-up includes a larger stabiliser bar, stiff front springs and carefully-chosen damping settings, which allow the Fullback to handle and ride with reasonable comfort and agility. Fiat might not have been able to change too much about the engineering of this Fullback pick-up, but its stylists have tried to give the vehicle more of its own character when it comes to the exterior look and feel. Distinctive swage lines along the flanks along with the sweeping shape of the front and rear lamps help fully integrate the load bed as part of the vehicle's overall design. Detailing is tasteful and restrained (for a pick-up) with two strips of satin silver trim used to frame the front grille on the entry-level SX, while LX versions also have a subtle satin silver trim around sump protector, as well as chrome-finished door mirrors, door handles and side steps. Smart 16-inch alloy wheels are standard on the SX while the profile of the LX model is enhanced with 17-inch alloy wheels and substantial, body-coloured wheel arch protectors. There's also a top 'Cross' model which features a more lifestyle-orientated look incorporating a satin silver finish for the skid plate, plus a matte black finish for the rear view mirrors, the door handles, the wheel arches and the 17-inch wheels. Inside all Fullbacks, there's a, two-tone black-and-silver dashboard, plus supportive and comfortable seats and decent rear passenger room. The vehicle only comes in the Doublecab format most UK buyers will want. Take a seat in the back and of course, it's nothing like as comfortable as it is in the front, but a six-foot adult can easily sit behind a similarly-sized driver, though the low seating position does mean that they have to bunch their knees up a bit. At the business end, you're faced with a cargo bed 475mm deep and 1,470mm in both length and width. In this area, you'd be able to take a payload of up to 1,045kg. Most rivals can better these figures but that, according to Fiat, doesn't tell the whole story. The brand points out that the stat that really matters to many operators is the one for combined carrying and towing capacity, an area in which this Fullback performs impressively. Combine the cargo area capacity with this model's prodigious braked towing capability of up to 3,100kg and you'll be able to lug up to 4,090kg - that's 77kgs more than an Isuzu D-Max and around 230kgs more than a Toyota HiLux or a Volkswagen Amarok. As for running costs, well expect the combined cycle economy figure will be somewhere between 39mpg and 44mpg, depending on the variant you choose. The brand reckons this means that your Fullback will be able to travel up to 685 miles on a single tank, which gives it one of the longest ranges in its class. Fiat is bravely pitching this Fullback at a starting price slightly higher than its Mitsubishi L200 equivalent. You're looking at an entry fee of around £21,000 for the base 'SX' version, which is about £1,000 more than an equivalent L200 Challenger-spec Doublecab model. However, bring the Mitsubishi up to this Fiat's level of spec and you'd probably have to pay as much, if not a bit more. Go for the plusher 'LX'-spec Fullback variant and you'll be loking at an asking price of around £23,000 - with an extra £1,400 premium to pay on top of that if you want an automatic gearbox. The top 'Cross' variant costs around £26,500. The 'LX' variant is very well equipped indeed. Included features run to 'keyless go' locking, full leather upholstery, electrically-adjusted and heated front seats, dual-zone climate control, bi-xenon headlamps with washers, enhanced body styling, privacy glass and a 6.1-inch touchscreen infotainment system with DAB, Bluetooth connectivity and satellite navigation as standard. Lane Departure Warning, a reversing camera and a comfort-oriented "Touring" suspension are also included in the LX specification. When equipped with a five-speed automatic transmission, the LX version adds an upgraded 7-inch infotainment system and transmission paddle gear shifters. At the business end, you're faced with a cargo bed 475mm deep and 1,470mm in both length and width. In this area, you'd be able to take a payload of up to 1,045kg. Most rivals can better these figures but that, according to Fiat, doesn't tell the whole story. The brand points out that the stat that really matters to many operators is the one for combined carrying and towing capacity, an area in which this Fullback performs impressively. Combine the cargo area capacity with this model's prodigious braked towing capability of up to 3,100kg and you'll be able to lug up to 4,090kg - that's 77kgs more than an Isuzu D-Max and around 230kgs more than a Toyota HiLux or a Volkswagen Amarok. As for running costs, well expect the combined cycle economy figure will be somewhere between 39mpg and 44mpg, depending on the variant you choose. The brand reckons this means that your Fullback will be able to travel up to 685 miles on a single tank, which gives it one of the longest ranges in its class. OK, so the Fullback isn't very Italian. It isn't even very Fiat. But who cares? It's a strong contender in the growing pick-up segment. How could it not be, based on the impressively complete Mitsubishi L200 Series 5? We think the Fullback is better looking than the L200. And it's certainly extremely well equipped, plus it's backed by the impressive resources of the Fiat Professional LCV dealer network. A strong contender then. If you're shopping in this segment, we think you might like it.